It is so peaceful and quiet here that we slept good all night. We got up at 7:30AM and I went out and hooked up the HF antenna. I had unhooked it last evening because we could hear thunder off in the distance. We had a few more rain showers overnight. I had a good chat with Dave, VE2EDB, from 8AM until 8:07AM. Dave, VE3EGC, checked in but I did not get a chance to say hello. John, VE1LZ, was first to check in on 7055 kilohertz and he was loud and clear from New Brunswick. VE1LZ was Don's old call sign from way back and I remember working him many times. It is amazing the memories from these call signs at times. Glenn drove the dually and he, Joan and I went to the TD Bank. We soon had things sorted out and all the bills paid. From there we went to Paul's new car body shop. Paul is Glenn and Joan's brother. The body shop is brand new in one of the largest GM dealerships. State of the art. From there we went to the grocery store in Orono and then home for lunch. Gail had to work this morning and Glenn met her in town and they were busy for the afternoon. Joan and I read. It was overcast all day with some mist at times. There are several robins around the trailer and they love to chirp. It makes it feel like spring at least. We hear the odd mourning dove that reminds us of the many we heard in Arizona. There are lots of birds around. Everything from humming birds to hawks. Every time you step out in the yard one of Glenn's turkeys will gobble. Usually his Newfoundland dog will bark. He has two dogs. 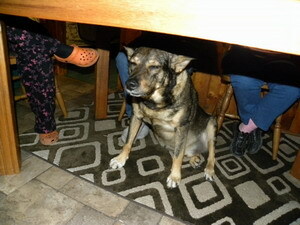 The other is a fairly large mongrel that is old and lame. His Newfoundland dog is named Maybe. Maybe she will and maybe she won't. She is the only Newf I have met that does not like water. She will go in till it touches her belly and then she is out. It is near impossible to get most of them out of the water. 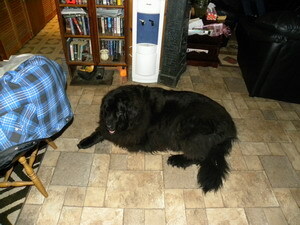 Even so she is your typical big loveable old Newf. Rollie is getting old and does not like to have his photograph taken. He has never liked it from the time he was a pup and as one can see he knew what I was trying to do. It probably was the flash that turned him against the picture taking. 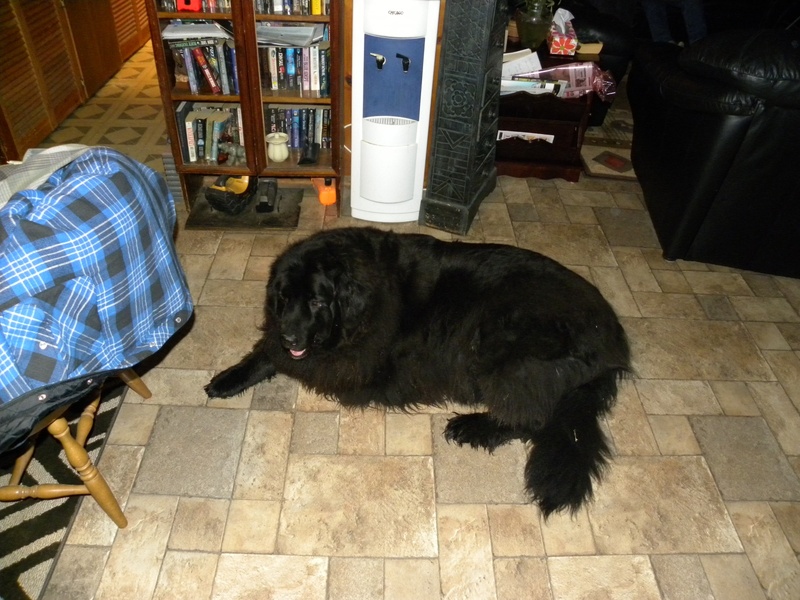 This is Maybe the loveable Newfoundland dog. Nothing bothers her including the flash on the camera. 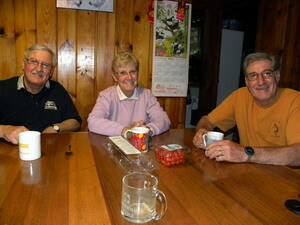 We had a great supper with Glenn, Gail, Joan, Paul and I. A great visit after supper and we called it a day when the visiting broke up.